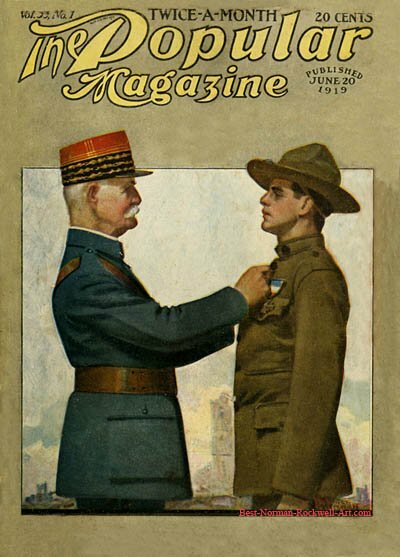 American Soldier and French General, this Norman Rockwell painting, appeared on the cover of Popular published June 20, 1919. This was the second cover illustration by Rockwell to appear on The Popular. The Popular only published two Rockwell covers, one in 1916 and this one in 1919. You can see the first Rockwell cover illustration for Popular magazine here. Rockwell only submitted to this smaller magazine after the publishers of the larger magazines had declined to publish the cover illustration. Clearly, Rockwell's first choice of publication was The Saturday Evening Post. He believed that the Post cover was America's biggest showcase window for artists. And his career confirmed this. In this painting, we see a scenario that was no doubt fairly common after the First World War. Many American soldiers were stationed in France during the war. They fought right alongside the French soldiers. They helped hold the line. A lot of soldiers were killed in France. Many more were wounded. This soldier survived all his battles unscathed. He shows no external woulds. His psyche may have taken some direct hits, but he isn't showing that right now. The soldier is being honored by a French officer. He is being awarded a medal that is being pinned on the chest of his uniform. By the publication date of this cover, the War had officially been over for several months. Since Rockwell painted topical and current subjects, we have two scenarios. One is that this painting was finished during the end days of the war and just not published until June of 1919. However, another scenario is more plausible in my mind. The more logical circumstance is that a soldier actually received a medal from the French army. When Rockwell heard this news, he immediately had an idea for another painting. It is even possible this story was reported in this very issue of Popular magazine. The popularity of Rockwell's illustrations was already established by 1919. It is very unlikely that one of his paintings would have sat unpublished for several months. This is one of the rarest Rockwell cover illustrations. I have never actually seen a copy in person, only a scan of this issue. I might not have even trusted this to be authentic if I hadn't known that the character of the person who shared it with me. That person is one of the foremost Rockwell collector I know of. Both Popular covers are extremely hard for collectors to find. Please contact me if you have a copy for sale or high resolution scans for sale .